The δ30Si signature of diatoms is well conserved through the water column despite strong silica and particulate organic carbon (POC) attenuation at depth and is closely linked to the Si consumption in surface waters. 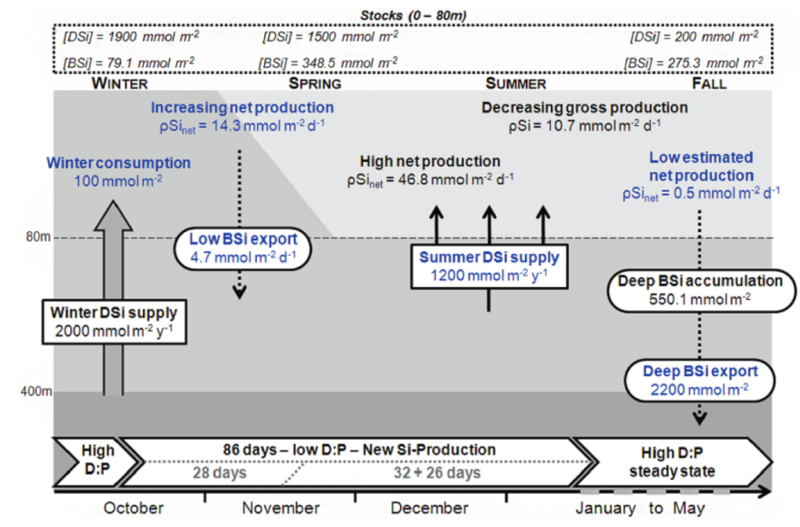 With the strong coupling observed between diatoms and POC fluxes in PFZ and AZ, these data provide new constraints for application to biogeochemical models of seasonal controls on carbon production and export. This data confirms the applicability of this isotopic proxy for paleo-oceanographic studies. It can also be used to estimate diatom’s settling rate. Such impacts are directly relevant to the efficiency of the carbon biological pump, the biological-control process transferring carbon from the surface to the deep ocean where carbon will be stored for centuries to millennia. In Delvaux et al. 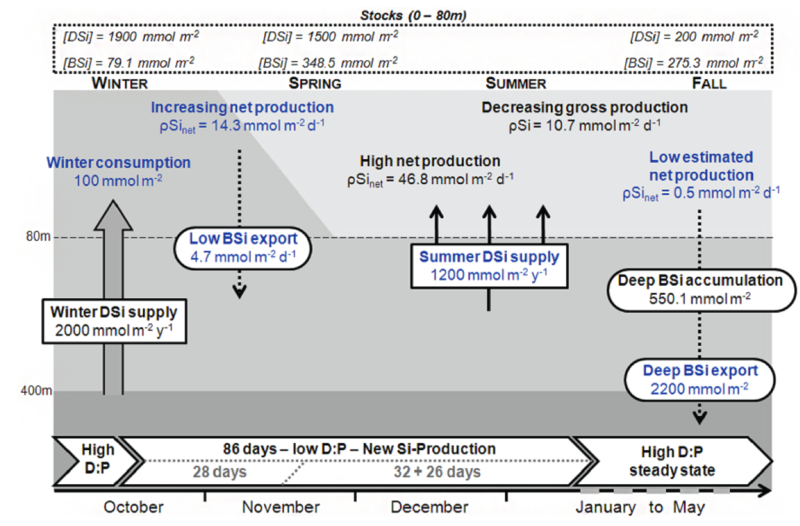 (2013), we analysed seasonal variations of Si isotopic signatures (δ30Si signature) of dissolved silicon (DSi) in the Scheldt (Belgium) freshwater estuary and in its main tributaries. We show that in this highly anthropogenised watershed, except during diatom bloom in spring/summer, the δ30Si is likely to controlled by land-use at the sub-basin scale. In Hughes et al. (2012), we show that the silicon fluxes and isotopic composition are modified by damming. Scientific impact: δ30Si can be used as a proxy sensitive to anthropogenic pressures on Si cycle. (i) During dry period, average δ30Si is 1.9 ± 0.4 ‰ (n= 58) which is almost 1 ‰ heavier than the world river supply to the ocean estimated so far. Indeed, contrary to a typical weathering control on riverine δ30Si as generally observed, there is no positive correlation between Dissolved Silicon (DSi) content and δ30Si. (ii) The δ30Si of monsoonal headwater samples are not significantly different from those of the dry period (1.64±0.55 ‰ and 2.01±0.61, respectively) despite there is almost no discharge during dry period. This indicates that the Si source to estuary is insensitive to the season even though it appears to be controlled by weathering as seen on the inverse relationship δ30Si vs. 1/DSi. Then, within estuary during monsoon, δ30Si is little changed and seems to be mainly controlled by mixing. Silicon isotopes of rivers (i.e. upstream estuaries) are more related to weathering and/or watershed characteristics (e.g. maybe land-use) than seasonal discharge.